Television • Viewers won’t see any changes, because Sinclair will remain in control after the sale. (Steve Ruark | The Associated Press) In this Oct. 12, 2004, file photo, Sinclair Broadcast Group Inc.'s headquarters stands in Hunt Valley, Md. Media company Twenty-First Century Fox is buying seven TV stations from Sinclair Broadcast Group for $910 million. The move comes as Sinclair is selling some stations to meet regulatory approval for its pending $3.9 billion acquisition of Tribune Media. Utah television station KMYU is being sold. If the deal goes through, as expected, local viewers won’t notice any changes whatsoever. The only change will come when the station’s broadcast license is transferred from the Sinclair Broadcast Group to conservative commentator Armstrong Williams, a longtime friend of Sinclair executive chairman David Smith. And that’s the point of this sale. Still trying to win approval for its takeover of Tribune Media, Sinclair has announced plans to sell a number of stations without actually surrendering control of them. When Sinclair announced it would acquire Tribune Media for $4 billion, it said it didn’t believe it would have to sell any stations — even though the takeover would give Sinclair 233 stations covering 72 percent of U.S. households, and the Federal Communications Commission caps that limit at 39 percent. Eventually, Sinclair announced it would sell a slew of stations, including current Tribune property KSTU (aka FOX 13) in Salt Lake City. Which was big of Sinclair, given that FCC regulations also prohibit it from owning both Channels 2 and 13. 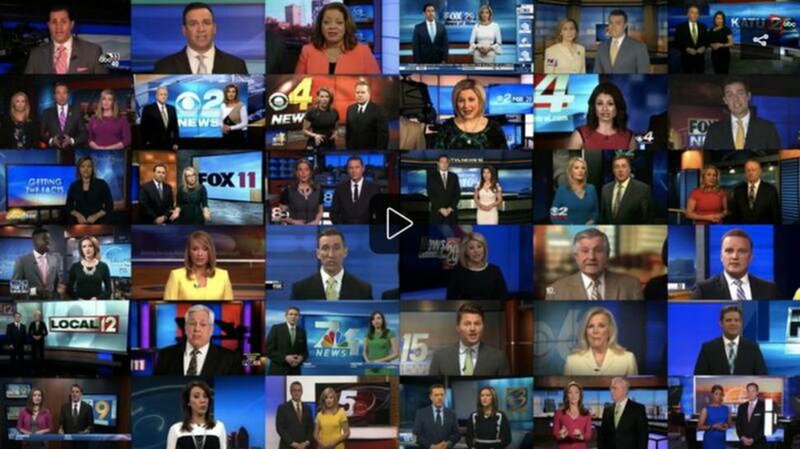 (Courtesy Deadspin) This screenshot of Deadspin's video showing dozens of anchors at Sinclair Broadcast Group stations across the country features KUTV's Shauna Lake and and Mark Koelbel (second column from right, third box down). If the deal is approved, KSTU and seven other stations will be sold to Fox. (But only if the FCC approves Sinclair’s takeover of Tribune.) That would be a bona fide sale. Other proposed deals are shams. Including the sale of KMYU, KUNS in Seattle and KAUT in Oklahoma City to Williams. It’s a legal fiction that allows Sinclair to comply with ownership rules. Sinclair is using Williams to maintain its hold on all three Utah stations it currently owns — KUTV, KMYU and KJZZ-Channel 14. Armstrong is getting three stations for $4.95 million, which analysts say is maybe 10 percent of their actual value; Sinclair will handle the entire operation for him; they will share the revenues. Armstrong has already purchased a number of stations from or through Sinclair, two of which Sinclair continues to operate. The KMYU deal is small potatoes, but no different than what Sinclair wants approved in two of the three biggest TV markets in America. The company that’s slated to “buy” Chicago’s WGN is headed by one of Smith’s friends, and Smith owns controlling interest in it. WPIX in New York City is slated to be “sold” to a company owned by the estate of Smith’s late mother. Both proposed sales are for a fraction of what the stations are actually worth. The FCC will decide if this is legal. The betting is that the deal will eventually be approved, although it’s taking a lot longer than anyone expected. Why should we care? Because it’s concentrating media power in the hands of the Smiths, who are already under fire for pushing their right-wing political agenda on Sinclair stations. While Sinclair is editorializing, it’s circumventing government regulations. And that, too, is worth remembering.